XenialDog is a fork of "DebianDog" which is a community project once started by forum member saintless. See also Here for Debiandog history. I will continue to maintain this version. There were several requests for a XenialDog64, so here it is now! See for planned fixes and changes on next iso release in second post. - Different applications, some are not present and some others added. - Choices of window-manager are: Openbox and Jwm , see for specifications below. Built from an absolute minimal Ubuntu full install (using mini.iso). Panel: Tint2 bottom panel or cairo-dock. Default File Manager - pcmanfm with option to use rox. Default Internet Browser - Firefox. Special thanks to Toni (saintless), William (mcewanw), Terry (sunburnt), The Flying Cat and all who helped by giving feedback on the DebianDog and Mintpup threads. 3.) Bug fix for RemasterDog (script to remaster) (copy progress bar didn't show). Replace initrd1.xz in the "casper" folder with the one from Here and encrypted savefile should work. Wow, you are getting to be a 'master' of these debian dogs. Will download tonight and get it set up tomorrow.......I must admit I'm kind of hesitant, though. I do not want to like it more than my DD32 Thanks, Fred! Everyone should try these DDs of yours, both 32 & 64..
like the design, my eye are still messed with SlacQ odd orange/peach .. need a change. Does multisession to DVD work in this WolfQ was fixed so I heard, did you built it with it? No idea what you mean with 'WolfQ', but no, sorry. multisession to DVD is not supported. 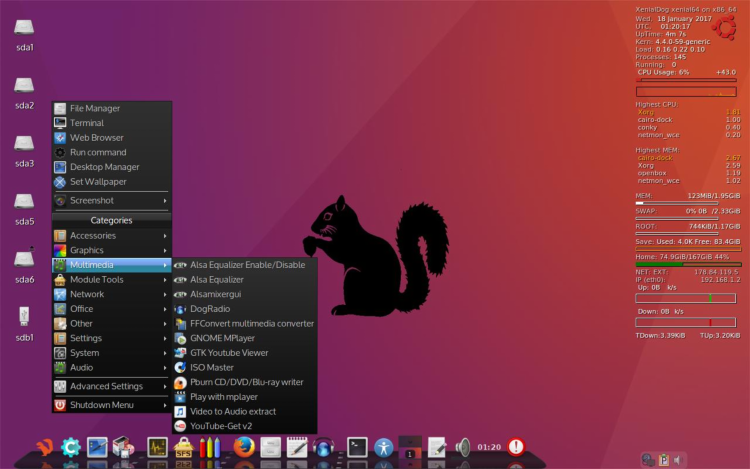 This is not a puppy, (not woof built, if you mean that) it's pure (mini) Ubuntu in fact, with some stuff added. Will download tonight and get it set up tomorrow.......I must admit I'm kind of hesitant, though. I do not want to like it more than my DD32 Wink Thanks, Fred! Everyone should try these DDs of yours, both 32 & 64.. Thanks Belham and you're welcome! Will re-upload ISO within half an hour. Are you kidding?! I stayed up (it's nearing 1:00am) just to play with this, have been setting things up inside it for the past hour, and now you're telling me there's no way to save all my work/settings on exit (I booted Porteus Save)? Fred, Fred, FRED..FREDDDDIE MERCURY!!!!!!!!! Lol, oh well, serves me right for staying up so late. I should have just went to bed. Below is the pic I took. It booted well (I did porteus save on exit). Of the few things I did get to try, when I took this pic, I must note that in right-clicking to "Open With..." and choose 'mtpaint', the dialog box brought back after clicking "Open With..." was blank, and said that no programs at all are installed in the OS. What?? Thus I couldn't choose anything and had to open mtpaint by its own icon, then head to the pic in ~root. My apologies , the only (yes, very, very weak ) excuse I have is that I never use save file (always folder or remaster). Re-uploaded ISO, see edit in my previous post. Maybe you used save to folder, no save-file creation utility is required for that to work well. I must note that in right-clicking to "Open With..." and choose 'mtpaint', the dialog box brought back after clicking "Open With..." was blank, and said that no programs at all are installed in the OS. What?? Thus I couldn't choose anything and had to open mtpaint by its own icon, then head to the pic in ~root. I added 'Beta' to the first post subject, because I think there should be done some more testing. Beta version for now, please test. In time I'll make *final* release. And that includes me, Fred! (I'm just popping in cos saw your long-awaited XenialDog 64bit release announcement. I like Ubuntu-system because I find that many apps my family use are more readily immediately available in binaries for Ubuntu systems than for other Linux's. Some AV apps prefer expect pulse-audio, so I prefer to include that (and I tend to find apulse solutions problematic/unstable). So would be good if you could add a quick note to remind me the best way to add pulseaudio so it is there on boot. Glad you are keeping up the good work and have a number of new users keeping an active interest in the project(s). Belated Happy New Year by the way! Hey William, good to see you! XenialDog64 probably needs some more polishing, feedback appreciated! What didn't work then? Details please!